You don't need a fancy car to start with when you are building your own classic. You don't need a bunch of fancy aftermarket parts either...or a fancy $8k paint job. But if you don't have any of those things or a pile of money, you need skill...mad skills. Find this 1976 AMC Hornet offered for $5000 near Seattle, WA via craigslist. Tip from JB1025. 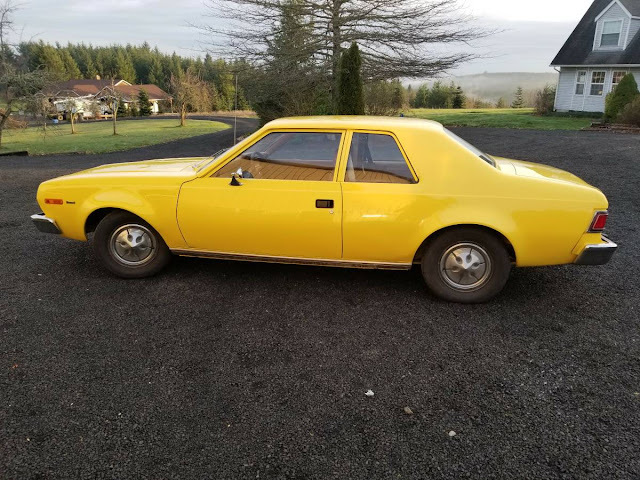 1976 AMC Hornet that I have spent hundreds of hours and thousands of dollars on. Rescued almost two years ago from a terrible fate, this Hornet has undergone a conversion that makes it a 70's classic econo-muscle while injecting the reliability of the venerable Jeep 4.0HO inline 6. The Drivetrain: 1991 Jeep 4.0 that was completely rebuilt from top to bottom. .030 overbore, new pistons, polished crank, new cam and lifters, redone head, valves, springs, seals etc... professionally built by a local shop. Mated to a Jeep 2WD 5 speed manual with new flywheel, clutch, throwout bearing, etc and driveshaft. New radiator, water pump, electric fan, Walbro electric pump, new fuel lines front to back, new hydraulic clutch set up, exhaust, sensors and more! Driven less than 800 miles so far. The Interior: New carpeting, interior is good, front seat needs some work as a seam has begun to unravel. Tilt steering column from a Jeep. We took this to a couple local car shows last year and it was a hit - no one had seen one in 20 to 30 years and we got the greatest comments that 4.0 conversion looks factory! Its a fun, very peppy car (the 4.0 is a torque monster, yet you get pretty good MPG as the car is light) with a modern drivetrain. Two reasons for selling - need space in the shop, and need funds for home improvements. Come take a look and make an offer. Title is clear and in my name. The work looks to be of high quality. I have to wonder how much of an improvement the engine swap really made, compared to the amount of effort it took. I think this might be an illustration of the old adage: "Be careful who [or what] you fall in love with". I'm looking at the top picture and thinking that the Homeowners Association has ordered the sale. No kidding. All that work and they put hubcaps on it? 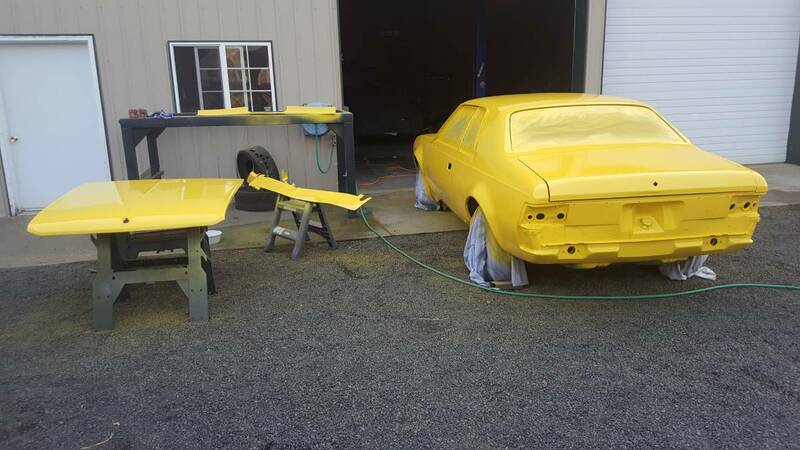 Plus, that yellow paint would have been my last choice. Stock hubcaps 4 Granma's sleeper look ! But Sean Scott like what you did with photo shop wheel dept. My dad was uh, thrifty, so he bought a series of used well-used AMCs when I was young, mainly Rebels and a 1970 Hornet with the straight 6. The thing I remember about that Hornet was the engine when idling was so smooth and quiet that you could barely hear it. I recall a couple of times my parents being distracted, starting the car, only to hear the started motor screech since it was already running. I also remember when I was closing in on 16, my dad sold a 1962 Thunderbird and was going to replace it with a Gremlin. I was horrified. In the end he ponied up for one of the first Rabbit Diesels off the boat. Painfully slow, but a good car to learn to drive on. 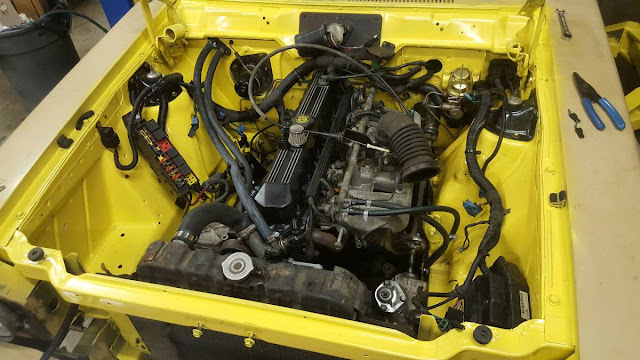 This is a cool build not far from home, love the engine, but I want nothing to do with a yellow Hornet. I lusted over this Hornet and almost bought it a year ago. I truly regret not doing so.